Abia Warriors ran away 2-1 winners against visiting Gombe United on Sunday at the Umuahia Township Stadium. Peter Onyekachi and Chisom Chikatara got the goals for the hosts while Babalo Haruna got one back for Gombe. 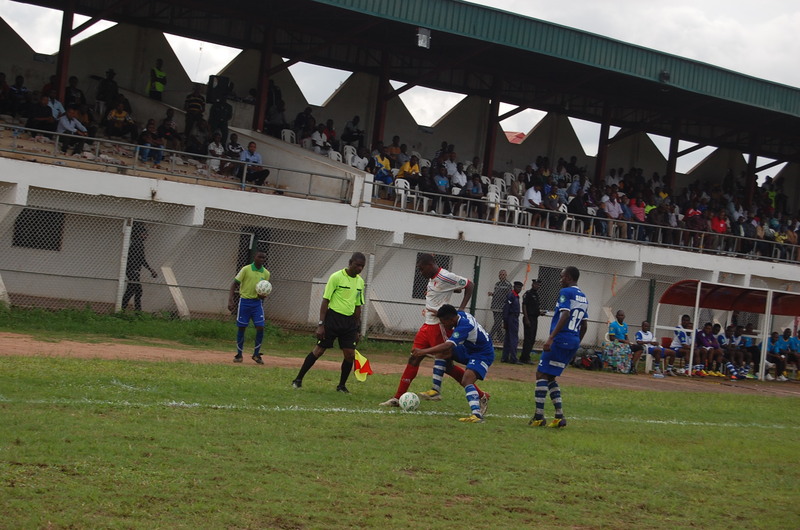 Despite their late surge, Gombe left Umuahia empty handed. Here are our three things from the game. Bosso’s boys are becoming astute at home: Earlier in the season, Abia Warriors were guilty of starting games poorly especially at home. They concede even before their manager gets seated in his technical area. Warriors play very good attacking football but they show their inexperience by allowing opponents score first leaving them chasing the game. In recent times however, Laden Bosso has fixed a clog in his machine; they are focused from the referee’s whistle now. Against Crown FC they were focused from the start; tight at the back and got 3 goals. It was same against Gombe United where they almost got a first minute goal through Peter Onyekachi but his effort hit the woodwork. Three minutes later, they were ahead and it was Onyekachi again, nodding in Ifeanyi Onyeadi’s corner kick. A minute later, they doubled. This time it was Chisom Chikatara nodding in Nwabalogu’s superb freekick. Starting brightly puts the opponents under pressure and although Warriors took time to learn that this season, it looks like the lesson has stuck. 2. Gombe can make life easier for themselves: In their last away game Gombe fell 3-0 to Rangers International but fought back to finish the game 3-3. They began in similar fashion against Abia Warriors conceding two goals first before they realized a football match had started. What followed next was surprising. They pegged Abia Warriors for most of the rest of the game and although they pulled on back, they couldn’t complete the comeback. What if they were a little tighter on Peter Onyekachi after his first minute strike hit the woodwork? What if they had limited the damage to just 1-0 and not fall back 2-0 before spending the rest of the game trying to climb a mountain they created for themselves? On the basis of what they put in after they conceded the second goal, Gombe showed that they had the ability to get at least a point in Umuahia but they had shot themselves in the foot first and had to leave empty handed. 3. Onyekachi makes a case for himself: It raised some eyebrows when Laden Bosso dropped his leading scorer Bishop Onyeudo to the bench. It was perhaps to give the striker a breather after a hectic past couple of weeks and in his place Peter Onyekachi was to lead the Abia Warriors attack with Chisom Chikatara aiding and abetting. Onyekachi had gotten the consolation goal in midweek against Sharks and resumed from where he stopped by putting his side ahead in the 4th minute. Not just that, he was a menace to the visiting defence as the game wore on even hitting the woodwork in one occasion. If Bosso is in doubt as to who should head his attack, back to back goals by Onyekachi has only compounded the problem for him; a ‘good problem’ nonetheless as many call it and of course a wakeup call for Onyeudo who could find himself on a spell on the bench if the Onyekachi – Chikatara combination remains rewarding.